A high intake of folic acid may reduce the risk of colon cancer, according to a brief report in this year's first issue of Nutriview, a newsletter on the role of micronutrients in nutrition and health. A study done on more than 88,000 women showed that women who consumed more than 400 mcmgs of folic acid per day had less chance of getting colon cancer than those who took less than 200 mcmgs of folic acid per day. Folic acid may also have an important role in preventing heart disease. Blood homocysteine levels have been indicated as a risk factor for heart disease. Some studies have shown that folic acid reduces the blood homocysteine levels, while some others have shown that people who have higher levels of blood homocysteine eat lesser amounts of folate-rich foods. Women with a low intake of folic acid were found to have double the risk of premature delivery and low infant birth weight. Infants who are born with low weight have greater chances of developing degenerative diseases in their adulthood. Folic acid deficiency is also shown to be associated with neural tube defects (birth defects occurring in the brain and spinal cord) and pregnancy loss in genetically-predisposed individuals. India has one of the highest number of neural tube defects. To prevent this, folic acid levels have to be built up prior to pregnancy. The importance of folic acid in the early stage of pregnancy and even at the time of conception has now been established. Folic acid (sometimes called folate) is a B-vitamin present in foods. It is required to build healthy red blood cells and genetic material. If there is less folic acid in the body, it can lead to a type of anemia. Folic acid is found in abundance in green leafy vegetables, pulses and liver. Among the pulses, channa, moong, lobia and urad are particularly high in folic acid. 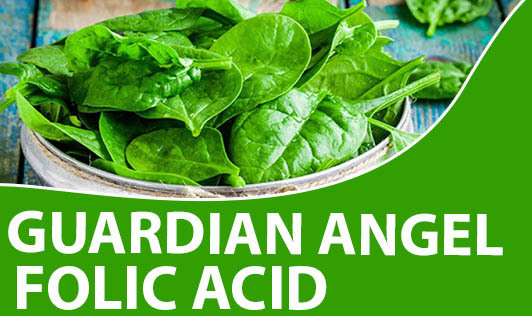 Among the green leafy vegetables, amaranth, spinach and mint are rich in folic acid. Cluster beans, ladies fingers and gingerly seeds are good sources of folic acid. If you eat 100 gm of any of these foods, you get more than 100 mcmgs of folic acid. Wheat germ and yeast also contain some amount of folic acid. Unfortunately, part of the folic acid gets destroyed while cooking. It would be a good idea to eat some of these foods raw, specially sprouted pulses and mint which can be used in salads. Using whole wheat bread in place of white bread and tandoori rod and whole wheat chapati in place of naan and roomali will retain the wheat germ and give you more folic acid. The international recommendation of folic acid intake is 170 to 200 mcmgs per day. Pregnant women need more folic acid - double the quantity - due to the large demands by the growing foetus. Therefore, folic acid supplements are normally recommended for them. During growth, demand for folate increases in infants and children. Some of the ready-to-eat foods have folic acid fortified in them. How much of it is absorbed and is useful for the body needs to be seen. Meanwhile, remember to eat right so that the body gets enough folic acid in order to prevent some major diseases. This is true more for young women who are yet to conceive because what they eat will decide how healthy their children will be!